Johnny Rooks rip meat at a carcass. All photo by Dr. Keith Bildstein, Hawk Mountain. 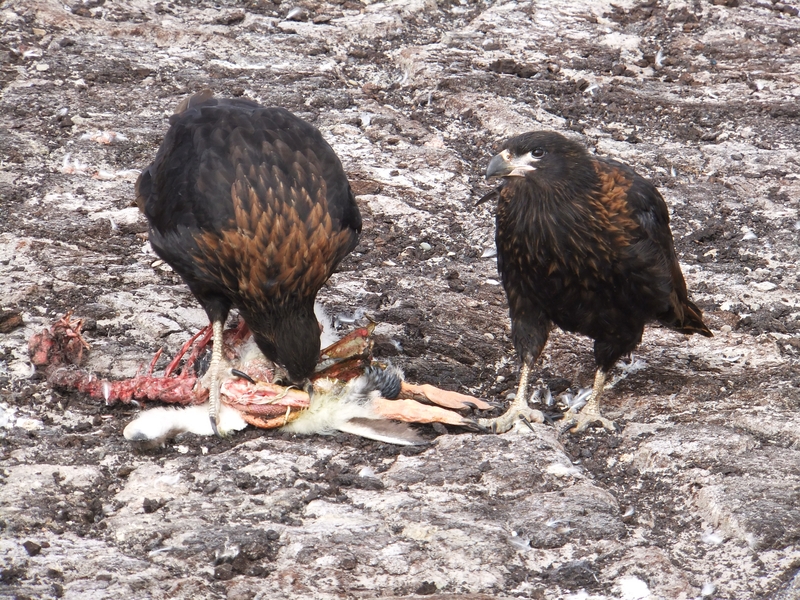 Having studied Striated Caracaras–or Johnny Rooks as they are often called–on the Falkland Islands for three years, I have steadfastly defended “my” species against their “flying devils” reputation. They are in no way “bad birds,” I have told people, but rather are merely curious and, at times, a bit mischievous, but certainly not mean spirited. But after what happened earlier today I may need to change, or at least temper, my feelings toward these birds. I bought a 4×4 ATV to help conduct road surveys on 49-sqaure-mile Saunder’s Island last year, and my first “quad-trip” from the farm settlement on the island to the Gentoo Penguin colony this February went off without a hitch. The ten-mile trek across rugged and rocky terrain had taken me more than an hour to complete, and I was eager to survey the penguin colony for color-banded caracaras as part of my ongoing research on their movement ecology on and beyond the island. Three un-banded Johnny Rooks met me and the quad at the gate to the penguin colony and I decided to take my ignition key with me just in case the birds had a mind to take my vehicle for a spin. I then went off on foot for my one hour survey at the colony. 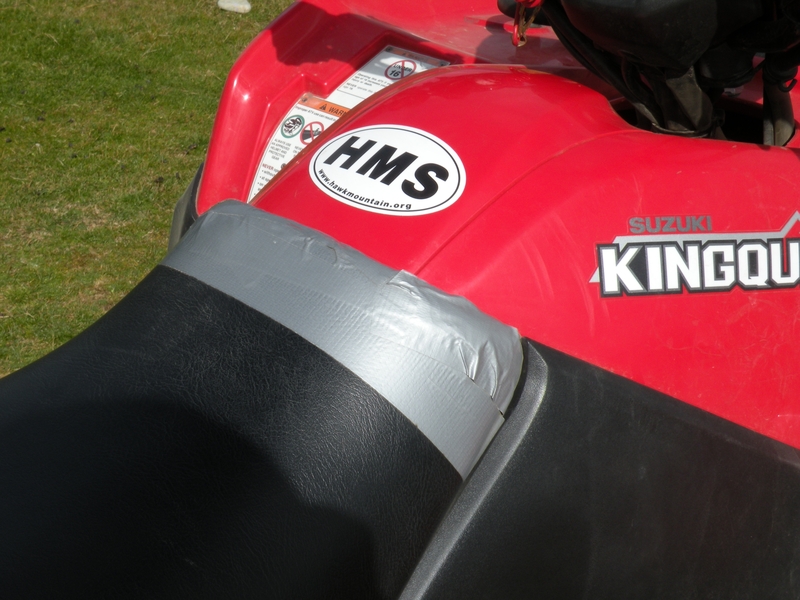 The brand new research quad already sports a duct tape racing stripe. Forty minutes later, when my quad was once again in view, I noticed that five Johnnies were hopping all over it, and that at least one bird was pulling at the vehicle’s black naugahide seat. I was still more than half a kilometer away and downhill from the quad, and I decided to continue my search for banded Johnnies and deal with un-banded individuals at the quad once I was done. When I closed to within 100 meters of the vehicle, I could see that the birds already had shredded the front edge of the seat cover and that two juvenile Johnnies were alternately pulling out the foam-rubber cushioning and calling out to the others to join in the fun. I often tell people that the strongest muscles in a Johnny Rook are its neck muscles, and strong neck muscles enhance their ability to quickly pull meat from penguin carcasses during the feeding frenzies they engage in. I was now witnessing how they managed to keep those muscles in shape: in less than an hour my relatively new quad had become an exercise machine, the avian equivalent of a stair-master for the neck. I sprinted the last 50 meters to the quad and surveyed the damage. Dozens of bite-sized pieces of foam rubber were scattered about the machine, as were several long strips of shiny new black naugahide. The dash board was missing several buttons, including the one that I use to reset the vehicle’s odometer to record distances traveled on my quad surveys, and the area around the ignition lock had been tampered with. Looking down at the three remaining birds, I proudly extracted the quad key from my jeans and showed it to them. “I outsmarted you guys,” I said to myself and placed the key in the ignition slot. But when I turned it, nothing happened. The horn worked just fine, but I couldn’t start the quad, and the idea of a ten-mile walk back to the settlement crossed my mind. Not fun and certainly, more than a bit embarrassing. Methodically inspecting the quad’s heavily festooned handle bars from left-to-right helped me solve the mystery. The Johnnies has pulled my emergency stop cord from its mooring and had hidden the critical connecting rubber plug under the cowling that surrounded the quad’s steering column. In less than a minute I reassembled the safety contraption, started the vehicle, took off toward the settlement. I spent the rest of the afternoon reupholstering my seat cushion with foam-rubber from my camera’s Pelican Case and an ever-handy roll of duct tape. 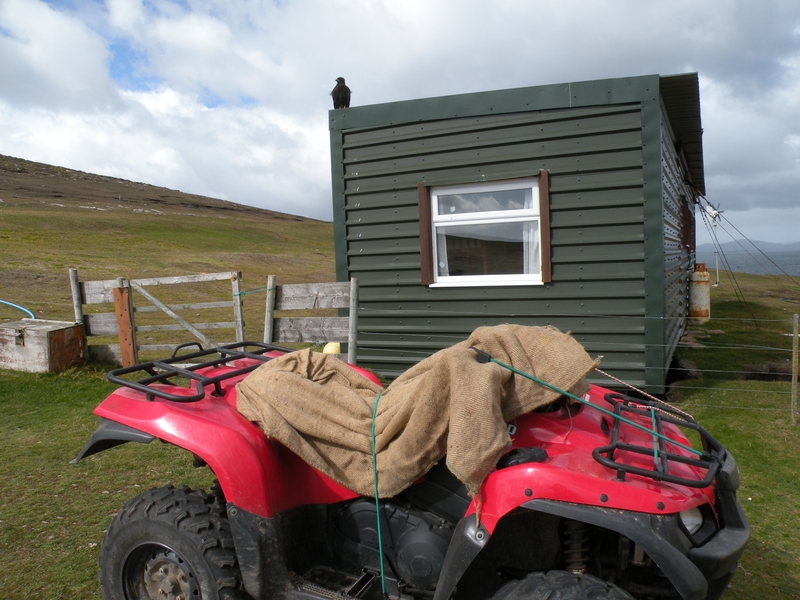 I then asked my Falkland Island hosts for suggestions on how better to protect my quad from my birds. A heavy-weight burlap bag appeared, together with a handful of bungee cords. Since then, cloaking my quad with burlap has prevented the Johnnies from destroying it. Note to researchers on Saunder’s Island: use burlap and bungee cords to protect your all-terrain vehicles. The take-home message: Flying devils? No, not really. It isn’t every day that a study species teaches a biologist how to take care of his equipment. In fact, I probably owe the Johnnies a favor for setting me straight on how to keep my quad intact. But I do have a suggestion for them. The next time they feel “instructive” I hope that they just write me a note on how to keep my equipment neat and tidy.